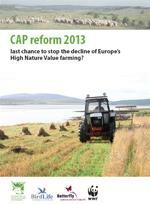 I have written before on the prospect of a new CAP for a new era of farming in Europe. The proposed changes were actually published about 6 weeks ago but it has taken a bit of time to sift through everything and really look at who wins and who loses out of this new approach. Speaking as someone who supports a system whereby production and the environment go hand in hand and can work together, not separately, I have been a little disappointed in the shortsightedness and inability to think a bit outside of the box that this document suggests. However, on the whole I feel that we are taking a step in the right direction. After years of planning I feel that the policy makers haven’t gone far enough in many areas – especially when it comes to rural development, community development and their greening measures. Perhaps unsurprisingly there has been little thought on a more holistic level. Their greening measures seem to be a bit simplistic – permanent grassland only has benefits when managed correctly and there should I feel be more beneficial payments available for those who integrate production and the environment in innovative ways. What about permaculture research? What about agroecology and innovative use of field margins? Where is the push for providing corridors? For hedge renewal? For real thought about habitat creation? For integration of farming practices and ecological thought about how we can best manage the land? There still seems to be a separation in the thought and policy process between food production on the one hand and the environment on the other. It is possible – as we have been exploring on this blog though various measures such as agroecology, to provide for both and indeed ‘use’ nature to our best advantage when using the land for food production. A bit frustrating anyway. It was a real chance for change and I feel they’ve fluffed it. Still, there is some good news. It is encouraging to see at least a degree of increased support base for young farmers and for small farms. It is also moving in a direction of increased support which could be seen as being good in providing a safety net. However Europe should I feel also be putting stress on laying pressure on the market to pay the real price for food – then we could actually think about removing subsidies gradually and making farming profitable. Will this happen though? I doubt it. There are also some other complications such as mandatory 3 or 4 crop rotations on an annual basis – what about those farms who only grow one crop annually and then rotate all fields at the same time on a 3 or 4 year basis? This allows the farmer to be efficient with costs as only certain machinery is needed in any one year and can be planned ahead for at the best possible price. So, in this very brief discussion of my thoughts on CAP – some positives and some negatives (from my view point also). Some say that by forcing a reallocation of subsidies payments will be made fairer from member state to member state. However, some countries who perhaps have a higher share of their GDP in agriculture or a higher percentage of their population engaged in farming will look at the reforms and be disappointed, seeing the same old member states as coming out on top. I would be interested to hear your views below. argylesock says… Here are good thoughts about agriculture in Europe. As so often. I think politicians’ short-term need to win votes can be in conflict with the land’s and seas’ needs to be sustainable. Thank you for the link to the Europa press release. I thought I was on the mailing list for that, but perhaps not – will join that mailing list now.